The DVSA (Driver and Vehicle Standards Agency), is a government organisation responsible for testing learner drivers; their examiners will assess your driving skills on the day of your driving test. Late last year, they started sending out text messages to learner drivers, either encouraging them or asking them to consider whether they feel confident and ready to take their test. These texts are planned to continue until February 2019. The texts are designed to inform, rather than replace, the discussions that students of Purple Driving will have before your test to check we’re both happy with your progress and ability. Why are the DVSA carrying out this research? Before they trialled the messages, BIT and DVSA undertook a period of fieldwork to consider the target group and touchpoints of users. ADIs, learners and test centre staff were interviewed and considered as potential trial participants. A final decision was made to use text messages. We designed the messages to try and complement learner drivers’ efforts to adopt safe driving behaviours. The DVSA hope that any learning they gain from this research will help them to develop future communications. How did the DVSA get my mobile telephone number? Anyone over the age of 17 in Great Britain is automatically opted-in to be part of research to improve road safety when they book their driving test. The messages are sent between 14 and 1 days before their test. You may receive 1 of 10 of the trial text messages, and only one of these messages will ask you for extra information. This message will be sent from a number ending 284. 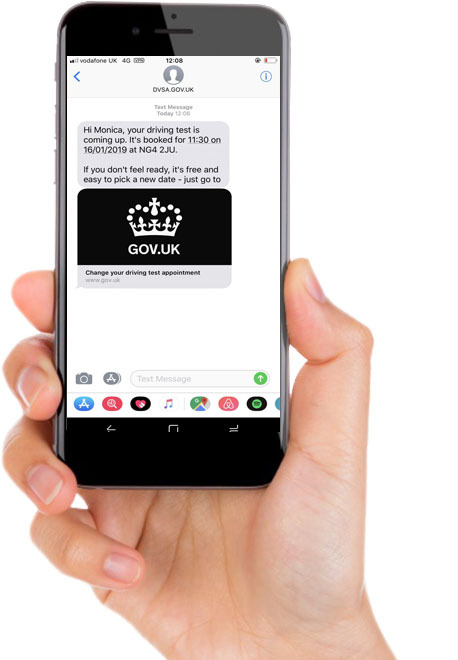 If you receive a text message asking how many hours you’ve driven for, it’s up to you to decide whether you respond or not, but any responses you do make will help the DVSA inform future communications to learner drivers. Other messages may ask you, the student, to consider things like whether you feel you have had enough practice in different weather conditions or tips on how to relax before taking your driving test. These will all come from the ‘Driver and Vehicle Standards Agency’. If you have any doubts about the authenticity of the text messages you may receive from the DVSA, please don’t hesitate to ask me in the first instance, and I will do all I can to help you. The image below is an example of what a legitimate text from the DVSA may look like. You may be wondering how the text messages comply with GDPR (General Data Protection Regulation) rules. As a government organisation, the DVSA can carry out research where it supports our public task. Making sure candidates understand and are prepared for their test meets that requirement. They’ve published their privacy notice on GOV.UK, which explains how they process candidate’s personal data. The data collected through this research will be stored for a maximum of 2 years. Do you have to receive these texts? No, you don’t, you can opt out of the research by emailing research2@dvsa.gov.uk. If an individual has already received the text that they need to respond to, they can reply "STOP" to not receive anything else. Purple Driving, owned and run by Helen Adams ADI - Helping you stay safe on the roads as always! Bob Hannigan is the Head of National Standards and Accreditation at DVSA. Part of his role is to look into how the DVSA can help make sure learners are ready to take their driving test, and to ultimately better prepare them for a lifetime of safe driving.